Around the Wherever: A forager's delight: raspberry pie! I baked mini raspberry pies from wild raspberries I foraged and crust I made from scratch today. I have mad skillz; what can I say? Just ignore the sad looking lattice work on the pies. 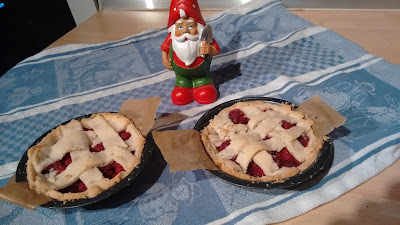 Despite that, the pie I had tasted great and even the gnome would love to dig in with his trowel. Raspberry pie - YUMM!!! We've got raspberries in our garden, so I should really try this. We usually just pick and eat them straight away. I think I told you a while ago I would send you my mom's sloppy Joe recipe when I have it, which I do now. If you send me an email (my address is on my blog), I'll send you the recipe. It was as good as I remember! I'll send you an email. I look forward to seeing what the recipe is.